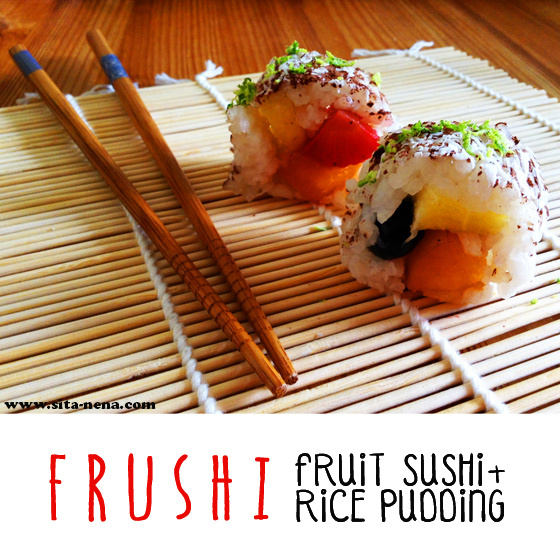 Our note: Here is the frushi, one of our creations by cooking a traditional recipe: rice pudding and adding something new: fruit sushi. When it comes to cooking, we can do everything. Enjoy your frushi! Our note: following the cups method for measurement units, we discovered that the volume of the cup is always the key, you don´t have to weigh the ingredients. 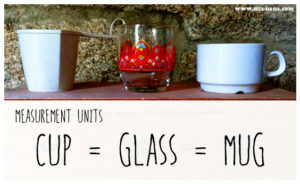 A cup has the same volume of ingredients (liquid or dry) as a glass or a mug. Seasonal fruit: strawberries, pineapple, apricot, blueberries. Our note: You can eat frushi anytime. It depends on seasonal fruit. 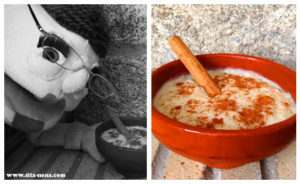 There are lots of tasty variations! 1. Wash and rub well the rice under the tap. Probably change the water around eight times to make sure that the rice is cleaned and ready to cook. 2. Put the milk in a saucepan and warm gently. When the milk is warm, add the brown sugar, vanilla extract, cinnamon slick and lemon zest. 3. Stirring until it’s all melted (consistency of a soup). Wait until the mix liquid begin to boil and add the rice. 4. Leave it to simmer, as slowly as you can, until the rice is well done. Be sure to stir occasionally to prevent sticking on the bottom of the pan. 5. The rice will take about 25-35 minutes or so in being well tender. Try it before removing it, and if the grain is quite tender, remove the lemon peel and cinnamon sticks and let it rest a little. 6. Stir the rice with a wooden spoon and let warm/cool it. The rice is ready to roll. 7. Mash the cooked rice with the banana. 8. Lay out the plastic wrap and spread the rice mixture on top of the plastic. You will want the rice to be roughly the depth of the tip of your pinky finger. Try to spread the rice in a rectangle shape. Use a Sushi map if it´s possible. 9. Cut into pieces the fruits: strawberries, apricots, blackberries, pineapple. Layer the pieces of fruits in a neat, tight row on one side of your rice rectangle. 10. Pull one side of the plastic wrap up and gently roll the frushi together. Stick the roll into the freezer for two hours to help solidify the rice. 11. After a couple of hours, when the frushi is ready, then take it out of the freezer. Unwrap the cling film and sprinkle over it with ground cinnamon, grated dark chocolate and grated lime zest. 12. Cut the frushi into short slices. 13. Serve frushi slices on a sushi plate with chopsticks and a small bowl of maple or agave syrup to dip. The history of sushi (Wikipedia, the free encyclopedia) in Japan began around the 8th century. The original type of sushi was first developed in Southeast Asia and spread to south China (before being introduced to Japan sometime around the 8th century) as a means of preserving fish in fermented rice. In the Muromachi period, people began to eat the rice as well as the fish. During the Edo period, vinegar rather than lacto-fermentation was used to sour the rice. In modern times, it is an early form of fast food strongly associated with Japanese culture. The term sushi comes from an antiquated grammatical form no longer used in other contexts, and literally means “sour-tasting”; the overall dish has a sour and umami or savoury taste. Narezushi is still made in Japan to this day. RECIPE: “Sushi Roll-inspired Tuna Salad Recipe” by Jen Miller from Jen Reviews.